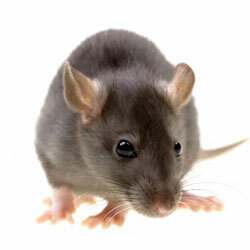 Rodents are recognized carriers of disease and can cause a lot of destruction to your garage and home. Whether you have mice, voles, rats, squirrels or other critters, getting rid of them can result in peace of mind and tremendous savings. It’s also important to understand that time is NOT on your side, since rats and mice can begin breeding within 60 days of birth and produce 8 or more litters a year. Actual Sightings – Seeing a rodent is the most obvious method of identifying their presence. However, most rodents are more active at night so sighting the varmints is also one of the least likely ways of knowing they have moved in. Droppings – Rats and mice will leave small, dark pellets in out of the way places such as in corners, inside a drawer, or near a food source. Be sure to sweep these up or use a Shop Vac. Sounds – Listen for grating or scratching sounds, generally at night. You may also hear occasional screeching or chirping sounds, especially when a new litter has been born. The sounds will typically come from inside walls, under cabinets or inside drawers or other containers. Gnawing – Scratch marks or small holes may be an indication of pests in your garage. Mice can fit through an opening as small as a coin, and will often gnaw an opening close to their food or water source. Nests – Matted fragments of cloth or paper is a common sign that a rodent has made a nest. You will find this type of sign in dark places, under boxes or boards, or in a drawer where shop rags. gloves or other ready nesting material is available. PETA suggests that every pest can be disposed of humanely, and that removing the food and water source is often the best deterrent. They suggest the use of non-lethal traps, which are more expensive than other methods but can be found at most hardware stores or online shops which sell hardware supplies or pest remedies. The University of Georgia warns that the use of lights or sound emitting devices is generally ineffective at getting rid of critters (source). While you may have some initial success, rodents will quickly become accustomed to the disturbances and will learn to ignore them much the same as person will become adjusted to recurring sounds or neighborhood lights that are on night after night. 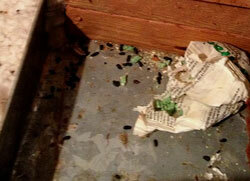 In the long run, pesticides or spring-loaded traps will usually prove to be the most effective way to get rid of pests. If you have spotted spoor or nests, placing a couple of baited traps in close proximity can eradicate vermin quickly. Despite the popular myth, cheese is not always the best bait to use, and many experts suggest using peanut butter, balls of bread or even chocolate to lure in unwary rodents. Since traditional traps are easy to find and cheap to buy, consider using several traps throughout the garage, especially near food, water, or nesting material. 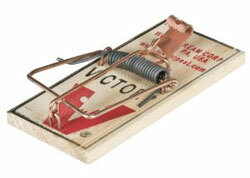 Check and re-bait your traps often until several days or even a week has gone by without trapping any vermin. Be sure to use gloves when removing rodents from traps and wash your hands thoroughly after doing so. 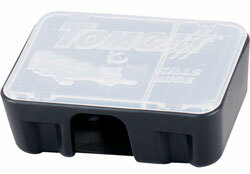 Another popular method of getting rid of mice is with bait stations such as the one by Tomcat. It uses an enclosed bait station which holds a small block of poison. Because it’s enclosed except for the small rodent opening, it’s completely safe around children, cats, and dogs and works well both indoors and outdoors. It works by attracting the rodent which then nibbles on the bait block. It doesn’t kill them immediately but after a day or two, it’s pretty much guaranteed you won’t have to worry about them anymore. Most often they ingest the poison and go back to their burrows where they die. These bait stations are a good alternative for those that are squeamish and don’t want to deal with regular snap traps. Remove any potential food or water sources inside the garage, and store your rags, cloth and paper in containers that are pest-resistant. Following these steps will remove most pests from your garage or home, and remove the incentives for future generations.